Fashion and luxury Top trends for fall / winter fashion 2018-2019. The windows in Rome are already with their proposals, what are this seasons must-haves… Ready for your luxury shopping iin Rome? Walking down Via Condotti and around the Spanish steps luxury shopping area under the hot August sun there is a finzy going on, on what are the hottest styles are for next autumn/winter? Roma Luxury has selected the top must-haves that you should have in your wardrobe this year, that we picked for you from the proposals of the top brands in Rome, to get and to take back with you if you want to be the most fashionable and elegant gal this coming autumn and winter. Even though the summer is not over yet, winter shopping is already going hot, the moment to think about the autumn season is here now. Whether you’re here in Rome now or still have to organize your flight in, come and take part of the hottest shopping spree experience in the most fascinating shopping area in the world, don’t miss out on it, it’s really fun and absolutely unique and exciting this dolce vita experiential shopping in Rome !!! Your image is fundamental if you want to be number one and the most commented on how GREAT you look, either for business meetings in fall or at those social events, both for that special evening in a restaurant or that exclusive VIP club event where everyone will be, you should be at your best and cure your image, and the Italian “Roma Luxury” Style is the absolute best for every occasion ! 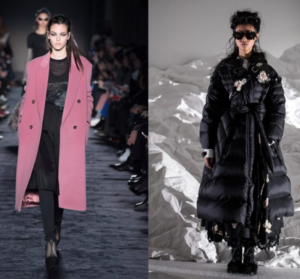 So what are the trends for next winter? Here is the eclectic chic mix between pure Zarina look in a unique activewear that will make you LOOK GREAT in almost a modern everyday occasion, whether you have a Versace Jumper or an elegant evening dress under it. Jackets, coats vs. bomber: The coats seen on the international catwalks seem to really satisfy everyone: they range from classic double-breasted shorts with candy shades, such as those by Herno and Tagliatore 0205, to fur or velvet models, to the most technical, but absolutely glamorous proposals by Woolrich, Moncler and Ottod’Ame. One shoulder vs. castigated dresses: Not only red carpet garment: the long dress has now been widely cleared and worn even on more informal occasions. Those of Salvatore Ferragamo for example – monochromatic with pleated details – are perfect even during the day, combined with a pair of ankle boots and overcoat in shades. The single-shoulder proposals by Roberto Cavalli and Ermanno Scervino are to be reserved for special evenings and special occasions, thanks to carefully studied cuts and transparencies. 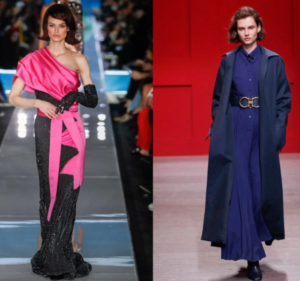 Chic and glamour Suits, masculine style versus feminine style: jacket and trousers, nail and pencil skirt, overcoat and long skirt. The suits return to have a place of honor in the wardrobe. 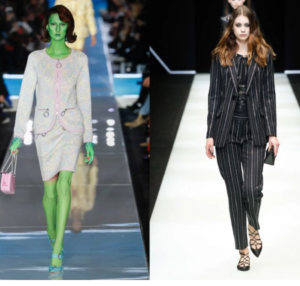 The official trend is Moschino: his suit aliens seem to come from space to give us a nice lesson in style, with jackets and skirts with measured volumes and perfect proportions. A formal but relaxed taste for Emporio Armani that brings back the pinstripe, a masculine fabric par excellence embellished with subtle metallic nuances. 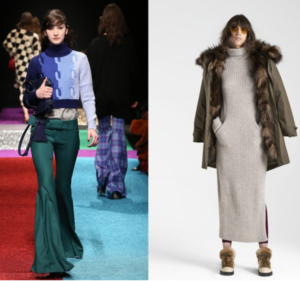 Knitwear, maxi dress vs. micro pull: As we prepare to face the coldest days of the year, the shows warm up with so much knitwear. The most chilly ones will rejoice at the sight of the long woolen knitted dresses that will accompany us during the next winter. If Woolrich proposes an ideal version for the office and the city, Max Mara makes it very elegant, focusing on dark melange gradations and fluid volumes. In the opposite direction go Marco De Vincenzo and Dondup with fancy micro pullovers. 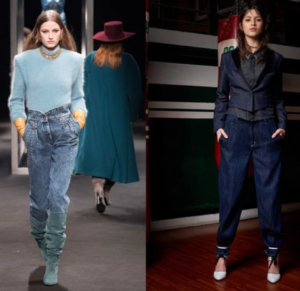 Denim: Comfortable, versatile and evergreen, denim takes the form of trousers, jackets, and shirts, to contaminate coats. Blumarine treats it like a sartorial fabric, enriching it with tone-on-tone fur inserts, Dondup works by overlapping giving rise to eclectic total looks, such as Rossella Jardini, which makes the ensemble more feminine with embroidery and trimmings. 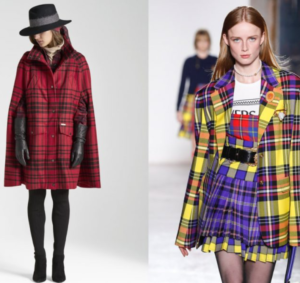 Tartan, gipsy vs. preppy: Scottish motifs, checked prints, check. Get ready to add a touch of Scottish style to your looks. In preppy and multicolor version, as Versace wants or in the form of a sophisticated cape like Woolrich. Prada makes it (almost) fluo, Max Mara interprets it in a gipsy-grunge key, on skirts paired with printed t-shirts. Does it seem too much? Then bet on the tailored blazers of Maryling and Blazé. 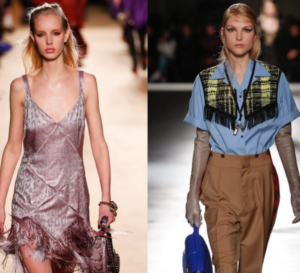 Fringes, glamor of the ’20s vs. ethno-chic mood: This is the definitive trend for the autumn-winter 2018, which takes a little ‘Charleston dancers, a bit’ modern cowgirl. Thin and very elegant fringes by Roberto Cavalli and Erika Cavallini. Ethno-chic fringes from Missoni and N.21. Fringes on the bags of Emporio Armani and Alberta Ferretti. Frange-bijoux from Versace. To put it in two words: fringes everywhere! Total black, prezioso vs. minimal: Back to black, one might say. Or maybe not, since that of total black more than a trend, is a reassuring constant in the style of many. A color-not color that lends itself to any occasion of use and that never bores. Do not you believe it? 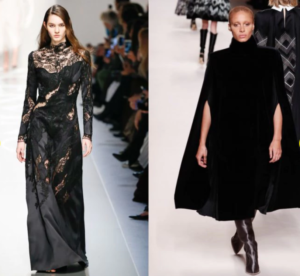 Take a look at the lace creations by Ermanno Scervino, the maxi hoods by Fendi or the trendy dress by Aspesi. Reserve your personal Roma Luxury look maker and shopping consultant and hop on the next flight over to Rome to have your Dolce Vita shopping experience in the most glamours shopping area in the world, that has hundreds of boutiques with amazing eye-popping stunning proposals for the whole family, all personalities, every occasion and needs, from prêt-à-porter, bespoke, haute couture ” Alta Moda” custom made or customized we’ve got it all covered with the best for those who want to be the absolute best !